The full grown larva in a black pistol case of 7 mm long. The mouth angle is c. 80°. From the rear end a grey silken cloak (“pallium”) hangs down to almost halfway the mouth. Hering (1957a) and others write that the species may also live, albeit rarely, on Betula; this is doubted by Emmet ao (1996a). Zoerner (1971a) found cases on seedlings of Fagus sylvatica; Drăghia (1972a) mentions Pyrus as a host. Probably these cases refer to stray larvae, trying to find a hibernation spot. 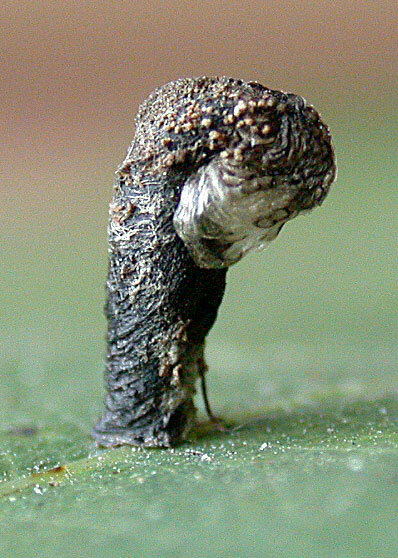 Larvae are full grown in early June (Emmet ao, 1996a). From Scandinavia to the Mediterranean, and from Britain to South Russia (Fauna Europaea, 2009). Coleophora nemorum Heinemann, 1954; C. ardeaepennella Scott, 1861; “ardeipennella” (misspelling); C. quercivorella Capuse, 1971. Toll (1952a, 1962a) shows a mouth angle of 45°; geographical variation? Baldizzone (1979a, 1987b, 1990b), Baldizzone, van der Wolf & Landry (2006a), Biesenbaum & van der Wolf (1999a), Buhr (1936a, 1964a), Drăghia (1972a), Emmet ao (1996a), Hering (1934a, 1957a), Huemer (2012a), Huemer & Erlebach (2003a), Klimesch (1942a, 1950c), Kollár & Hrubík (2009a), Kuchlein & Donner (1993a), Kuchlein & de Vos (1999a), Leutsch (2011a), Nel (1992b), Patzak (1974a), De Prins (2010a), De Prins & Steeman (2011a), Razowski (1990a), Robbins (1991a), Schütze (1931a), Sefrová (2005a), Suire (1961a), Sønderup (1949a), Stammer (2016a), Szőcs (1977a, 1988a), Toll (1952a, 1962a), Zoerner (1971a).